The only resort-style property in town, Providence Marriott Downtown provides a refreshing travel experience for individuals and groups headed to Rhode Island. Showcasing an award-winning culinary team and stunning event spaces as well as an indoor and outdoor pool, our hotel is much more than just a place to stay. Don't miss out on mouthwatering cuisine at Bluefin Grille, offering sustainable menu items sourced from our very own Chefs Garden in addition to local farms and proprietors. AQUA provides a downtown oasis to lounge, dine and party outside by the pool. When you're ready to take on the city, complimentary shuttle service is available to transport you to places including the local Amtrak train station and Rhode Island Convention Center. 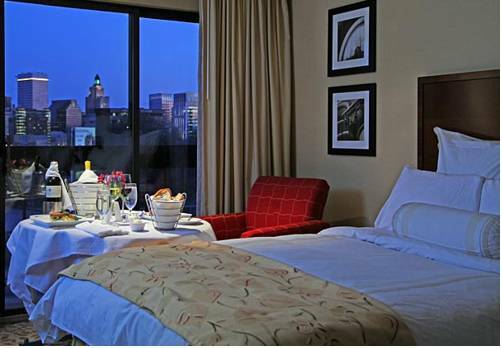 The hotel is also near WaterFire Providence and the shops and restaurants of Providence Place Mall. From pet-friendly rooms to a pampering spa, Providence Marriott Downtown ensures a dynamic experience that will keep you coming back time after time. Bluefin Grille: Our restaurant in downtown Providence features globally inspired cuisine using fresh, locally grown ingredients. Discover a casually elegant atmosphere, proven to be a favorite among locals and visitors alike. Bluefin Lounge: The Bluefin Lounge features a full bar menu with favorites sure to satisfy every palate. Sophisticated yet casual, the lounge is one of the premier downtown Providence hotspots you don't want to miss. AQUA: Discover AQUA, the city's premier pool and private party experience. An oasis in the middle of the city, this space blends water, fire and live music to create a temptingly cool escape. Starbucks : Grab your favorite hot or cold drink, pastry and sandwich before chatting with friends or relaxing with a good book anywhere around our Providence hotel.